The Dry Erase Magnetic Strip Rolls are stong flexible magnet that allows you to use dry erase markers on the front side. The dry erase magnetic strip is available in white, orange, red, green and yellow. The magnetized strips have a dry erase front and black magnet on the back. The magnet is easy to use and cut with scissors or a utility knife. The dry erase magnet is perfect for shelf labels, production schedules, teaching aids in the classroom, message boards and much more. The Dry Erase Magnetic Strip Rolls are stong flexible magnet that allows you to use dry erase markers on the front side. The dry erase magnetic strip is available in Choose Your Color: white, yellow, red, blue, green, black, orange and silver. The magnetized strips have a dry erase front and black magnet on the back. The magnet is easy to use and cut with scissors or a utility knife. The dry erase magnet is perfect for shelf labels, production schedules, teaching aids in the classroom, message boards and much more. 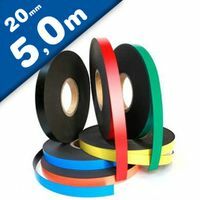 Coloured magnetic strips and tape are an excellent flexible magnet solution for many commercial and industrial applications. 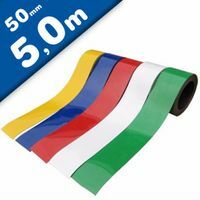 They are ideal for use in charts, on magnetic whiteboards, on pallet racking as identification labels, and are great for many general labelling uses in your office, factory, warehouse or home. 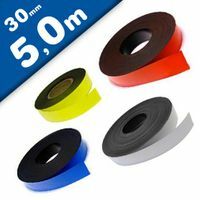 Our sortiment of colored magnetic strips give you the flexibility to change and move data in seconds. Five available colors make color coding simple. Ideal for use on magnetic boards or any steel surface such as shelves, file cabinets, bins, tool boxes, drawers, machinery, and doors. 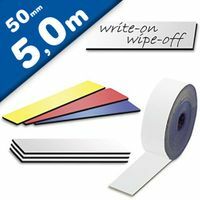 Strips have write-on/wipe-off surface for use with water soluble markers only and easily cleaned with a damp cloth. Easily cut to desired length with scissors and mark with permanent or water-soluble (dry-erase) marker so you can reuse the tape. Labeling tape will not scratch surfaces. 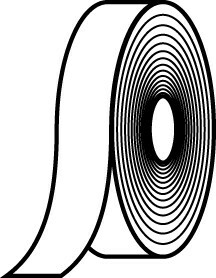 The magnetic surface is powerful and permanently magnetized. Write on, wipe off magnetic strips are the perfect magnetic accessory for any magnetic scheduling or planning board. These colorful magnetic strips from Magnosphere allow you use your magnetic scheduling board more efficiently. Why erase and re-write the same information in a different block when you can write the information onto a colorful magnetic strip and simply move it? Colored write on, wipe off magnetic strips come in eight different colors and a variety of packages. You can order pre-cut magnets in packs of 25 or 100 or you can order them in smaller 30" long strips and cut them yourself. Perhaps the most economical and efficient way to purchase is the 15' long rolls. All of the colored magnet strips can easily be cut to size with a pair of scissors. Write on the colored strip magnets with a damp erase marker. They erase using a damp cloth. Dry erase markers will not erase from the surface. Who supplies high quality Coloured Dry Erase Magnetic Strips? 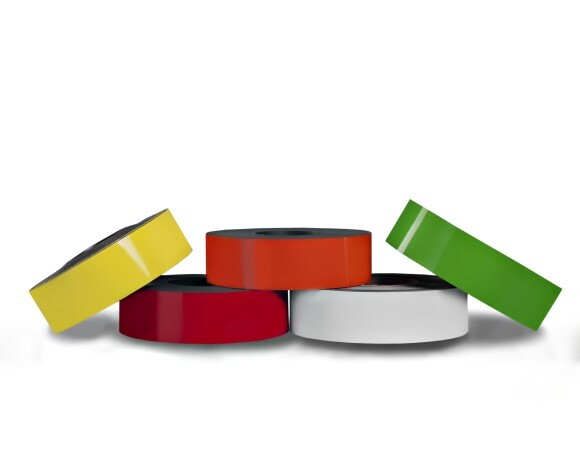 Magnosphere offers best priced Coloured Dry Erase Magnetic Strips globally to all industries, including Automotive, Aerospace, Military, Advertising, Design House, Electronic and Academic/R&D. Please inquire for custom Neodymium magnets or magnetic assembly. Buy Coloured Dry Erase Magnetic Strips at Magnosphere and get a better deal!